* Product tested as manufactured. Test data is based on average taken over several production runs and should not be considered or interpreted as minimum or maximum values. Values are typical data as manufactured and not limiting specifications. All values = 10%. See www.InterWrap.com/RhinoRoof for complete coverage and restrictions. 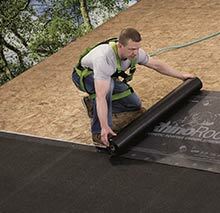 The self-adhered layer in a roof deck protection system provides a waterproof barrier for vulnerable areas on a roof. Whether the building is faced with wind-driven rain or the potential for ice damming, having a waterproof barrier will help provide protection for a long-lasting roof. RhinoRoof Granulated self-adhered underlayment provides that essential waterproof barrier as a second line of defense against water mitigation. 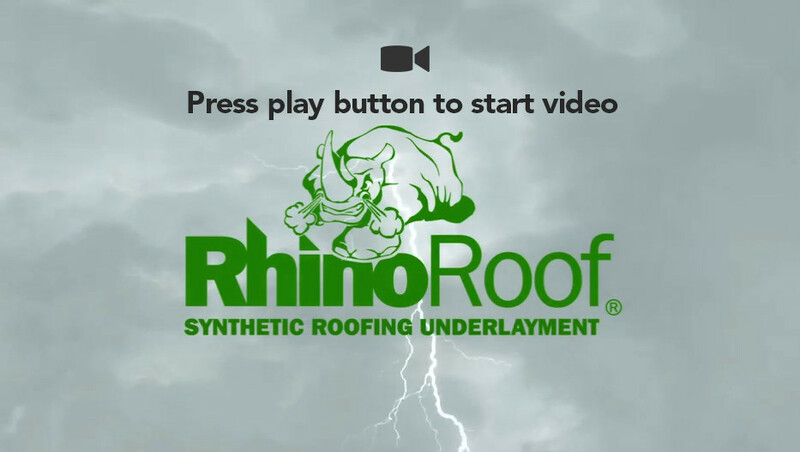 RhinoRoof Granulated combined with a synthetic underlayment, such as RhinoRoof U20 creates an underlayment system to protect the roof deck from eave to peak. RhinoRoof Granulated is a waterproof barrier and therefore must be installed above a properly ventilated space(s). Follow ALL building codes applicable to your geographical region and structure type as it is considered a vapor barrier. RhinoRoof Granulated should be stored at room temperature, upright in the original cardboard packaging in a dry properly ventilated area. Keep product sheltered from the elements. Only rolls destined for same-day use should be removed from their storage area. For best results store in temperatures between 40°F (4.4°C) and 90°F (32°C). If room temperature storage is not available and product is at a temperature of 40°F (4.4°C) or less, move the product to a warm area prior to application. If product has been stored in temperatures above 90°F (32°C) it may become difficult to remove the release backing. If this situation should occur, move product into a shaded area until the product is cool. Once cooled, the release backing can be easily removed. Sweep the deck to remove dirt, debris, and any damaged or rotten wood must be replaced. RhinoRoof Granulated must be applied directly to minimum 3/8 inch-thick plywood, 7/16 inch-thick OSB decking, or minimum 6 inch-wide deck boards (gaps no greater than 1/4 inch) on roofs with a slope of 2:12 or greater. For re-roofing projects replace any water damaged sheathing and sweep roof deck thoroughly removing dust, dirt and loose nails. Do not install over old roof covering. For best results RhinoRoof Granulated must be installed over a clean, smooth and dry roof deck. For cold weather applications 40°F (4.4°C) or below, a primer should be used and the laps blind nailed (see note 5 under application). The primer should be solvent or water based and meet ASTM D41 for asphalt based self-adhering membranes. For steep slope applications (3:12 or greater) or when installing at temperatures greater than 100°F (38°C) it is recommended to blind nail the selvage edge area as per note 5 below under application. RhinoRoof Granulated is to be laid out horizontally (parallel) to the eaves with the printed side up, using 3 inch horizontal laps and 6 inch vertical laps with the lower edge of the RhinoRoof Granulated flush with the outside of the drip edge. The lower edge of the underlayment is the edge that does not have a film selvage edge. End laps should be offset a minimum of 6 feet on adjacent courses. On slopes greater than 6:12 after installation of each piece, overlap the 3 inch film selvage edge and, if necessary, secure with nails installed in the selvage edge spaced 12 inches on center. Blind nail with 3/8 inch head roofing nails of 1 inch or longer in the 3 inch selvage edge area. Consult local building codes for fastener requirements. Always work from the low point to the high point of the roof. Apply the membrane in valleys before the membrane is applied to the eaves. Cut the membrane into 15 foot to 20 foot lengths. Peel back 1-2 feet of release liner, align the membrane, and continue to peel the release liner from the membrane. Hand press or walk on, then follow with a 40 lb. or heavier weighted roller to smooth and secure the membrane. Hand rolling over the selvage edge and directly above the selvage edge using a minimum 4 inch-wide, 10 lb. roller is recommended. If a roller is not available or not considered safe, walk on all laps, and as much of the field area as possible to push the adhesive into the pours of the roof deck and overlap. RhinoRoof Granulated should be applied over the metal drip edge at the eaves unless otherwise specified by local codes. Along rakes, apply RhinoRoof Granulated underlayment first, and install drip edge over the underlayment. Do not fold RhinoRoof Granulated over the roof edge unless the edge is subsequently covered over by a drip edge or other flashing material. In areas where ice damming can occur, install RhinoRoof Granulated from the eave up the roof to a point not less than 24 inches inside the exterior wall. Consult your local building code for specific requirements. For valley applications, peel the release liner; center the sheet over the valley and hand press in place from the center of the valley outward. Note: It is very important RhinoRoof Granulated stay in contact with the roof deck into and out of the valley area. RhinoRoof Granulated should never be suspended or bridge a valley. It is recommended to follow up with a weighted roller or by walking on the surface. Give special attention to ALL perimeter edge areas. If fasteners are removed leaving holes in the membrane or other penetrations are accidentally produced, they must also be patched. Do not install fasteners through membrane over any unsupported areas of the structural deck, such as over joints between adjacent structural panels. For geographies with high elevation, high wind or wind driven rain it is recommended to cover the entire roof deck with RhinoRoof Granulated. FASTENERS: For same day coverage with primary roofing RhinoRoof Granulated can be anchored with corrosive resistant 3/8” head x 1“ leg roofing nails (ring shank preferred, smooth leg acceptable). The use of every other anchoring location printed on the product is also acceptable. If RhinoRoof Granulated will be left exposed for up to 60 days the product must be anchored with 1" plastic or metal cap smooth or ring shank roofing nails and anchored in all locations printed on the facer. DO NOT USE STAPLES: the use of staples to penetrate RhinoRoof Granulated will void warranty. ANCHORING: All anchoring nails must be flush, 90 degrees to the roof deck, and tight with the underlayment surface and the structural roof deck. Where seams and joints require sealant or adhesive use a low solvent plastic roofing cement meeting ASTM D-4586 Type 1, or Federal Spec SS-153 Type 1 such as Karnak, Henry, DAP, MB, Geocel or equivalent. Acceptable alternatives are butyl rubber, urethane, and EDPM based caulk or tape sealant. EXTENDED EXPOSURE: If RhinoRoof Granulated product will be exposed longer than 24 hours and up to 60 days then product must be attached to the structural roof deck using a minimum 1” diameter plastic or metal cap roofing nails (ring shank preferred but smooth leg acceptable). Miami Dade approved tin tags/metal caps are also acceptable, and it is recommended for best performance to use with the rough edge facing up. For extended exposure it is always recommended to anchor on every printed position on the facer. RhinoRoof Granulated is not designed for indefinite outdoor exposure. For extended exposure conditions where driving rain or strong winds are expected it is recommended to take additional precautions such as doubling the lap widths. Alternately or in addition to a compatible sealant could be used between the laps or a peel and stick tape could be applied to the overlaps. Good safety practices should be followed on steep slope roofs, such as use of tie-offs, toe boards, ladders and/or safety ropes and personal body harnesses. Follow OSHA guidelines. Slip resistance may vary with surface conditions from debris that accumulates, weather, footwear and roof pitch. Failure to use proper safety gear can result in serious injury. Depending on roof pitch and surface conditions, blocking may be required to support materials on the roof and is good safety practice. Remember to seal the nail holes after removing blocking. La membrana granulada RhinoRoof está diseñada como una barrera impermeable secundaria para usarse en techos de pendientes pronunciadas (2:12 o superiores) debajo de tejas asfálticas, tejas de Composite, tejas de pizarra y tejados de madera. La membrana granulada RhinoRoof debe almacenarse a temperatura ambiente, en un lugar seco y bien ventilado, en posición vertical y dentro del empaque de cartón original. Mantenga el producto protegido contra las condiciones climáticas. Únicamente deberán sacarse del área de almacenamiento los rollos que se utilizarán el mismo día. Para mejores resultados, almacene a temperaturas entre 40°F (4.4°C) y 90°F (32°C). Si no es posible almacenar el producto a temperatura ambiente y la temperatura es de 40°F (4.4°C) o menos, mueva el producto a un área más cálida antes de la instalación. Si el producto ha estado almacenado a temperaturas superiores a 90°F (32°C), es posible que sea difícil retirar el papel antiadherente. Si esto ocurre, traslade el producto a un área con sombra hasta que se enfríe. Una vez que se enfríe, será fácil retirar el papel antiadherente. Barra la estructura del techo para eliminar los residuos y la suciedad, y repare cualquier daño o sustituya la madera podrida. La membrana granulada RhinoRoof debe instalarse directamente en revestimientos de madera contrachapada con un grosor mínimo de 3/8 pulgadas, paneles de fibra orientada (OSB) con un grosor mínimo de 7/16 pulgadas o placas de estructura base del techo con un ancho mínimo de 6 pulgadas (las separaciones no deben ser mayores a 1/4 de pulgada). En proyectos de reconstrucción de techos, reemplace los revestimientos dañados por el agua y barra perfectamente la estructura del techo para eliminar el polvo, la suciedad y los clavos sueltos. No realice la instalación sobre recubrimientos de techo antiguos. Para mejores resultados, la membrana granulada RhinoRoof debe instalarse sobre una estructura de techo limpia, lisa y seca cuando la temperatura ambiente, de la membrana y del sustrato sea superior a 40°F (4.4 °C). Para instalaciones en climas fríos, debe utilizar un imprimador y los clavos de las superposiciones no deben quedar expuestos (vea la nota 5 bajo instalación). El imprimador debe cumplir con la norma ASTM D41 de membranas autoadhesivas para tejas asfálticas. Todo sustrato preparado con un imprimador debe dejarse secar por completo antes de la instalación. Consulte las recomendaciones del fabricante. En aplicaciones en pendientes pronunciadas (5:12 o más), o cuando la instalación se lleve a cabo en zonas con vientos fuertes o a temperaturas mayores a 100°F (38°C), se recomienda clavar el área del borde superpuesto de acuerdo con la nota 5 que se muestra más adelante bajo Aplicación. La membrana granulada RhinoRoof se debe colocar en posición horizontal (paralela) a los aleros, con el lado impreso hacia arriba, con superposiciones horizontales de 3 pulgadas y superposiciones verticales de 6 pulgadas, de modo que el borde inferior de la membrana granulada RhinoRoof quede al ras de la parte exterior del borde de goteo. El borde inferior de la membrana impermeabilizante es el borde que no tiene un borde de película superpuesto. Las superposiciones de los extremos deben desplazarse un mínimo de 6 pies sobre las hileras adyacentes. En pendientes superiores a 5:12, después de instalar cada pieza, superponga el borde superpuesto de la película de 3 pulgadas y, si es necesario, coloque clavos en el borde superpuesto de manera que queden espaciados cada 12 pulgadas desde el centro. Haga un clavado invisible con clavos para techo con cabeza de mínimo 3/8 pulg., lo suficientemente largos como para atravesar el revestimiento. Los clavos deben estar espaciados a 12 pulg. de la parte central en el área de la película antiadherente. Consulte los códigos de construcción locales para conocer los requisitos sobre sujetadores. Siempre trabaje comenzando por el punto más bajo hasta el punto más elevado del techo. Aplique la membrana en las limahoyas antes de aplicarla en los aleros. Corte la membrana en tramos de 15 a 20 pies. Despegue de 1 a 2 pies de papel antiadherente, alinee la membrana y continúe despegando el papel de la membrana. Presione con la mano o camine sobre la membrana; después, continúe con un rodillo de 40 libras o de mayor peso para alisar y fijar la membrana. Se recomienda pasar el rodillo manualmente sobre el borde superpuesto, directamente encima, usando un rodillo de 10 libras con un ancho de 4 pulgadas como mínimo. Si no cuenta con rodillo, o si no cree que su uso sea seguro, camine sobre todas las superposiciones, y en la mayor área de superficie posible, para que el adhesivo entre en los poros de la estructura de techo y en las superposiciones. La membrana granulada RhinoRoof debe aplicarse sobre el borde de goteo metálico en los aleros, a menos que los códigos de construcción locales especifiquen lo contrario. A lo largo de las cornisas del tímpano, aplique primero la membrana granulada RhinoRoof e instale el borde de goteo encima de ésta. No doble la membrana granulada RhinoRoof por encima del borde del techo, a menos que el borde esté cubierto de manera continua por un borde de goteo o algún otro material tapajuntas. En áreas en las que pueda haber acumulación de hielo, instale la membrana granulada RhinoRoof partiendo de los aleros hacia el techo, hasta un punto ubicado por lo menos 24 pulgadas adentro de la pared exterior, medido horizontalmente. Consulte los códigos de construcción locales para conocer los requisitos específicos. En las aplicaciones de las limahoyas, despegue el papel antiadherente; centre la hoja encima de la limahoya y presione con la mano para colocarlo en su lugar desde el centro de la limahoya hacia afuera. Nota: Es muy importante que la membrana granulada RhinoRoof quede en contacto con la estructura del techo tanto dentro como fuera del área de la limahoya. La membrana granulada RhinoRoof nunca debe quedar suspendida ni hacer un puente en una limahoya. Se recomienda continuar con un rodillo de cierto peso o caminar sobre la superficie. Ponga atención especial en TODAS las zonas de bordes perimetrales. Si se quitan los sujetadores y quedan orificios en la membrana, o si se producen accidentalmente otros tipos de penetraciones, estos también deberán parcharse. No instale sujetadores en la membrana encima de áreas de la estructura del techo que no cuenten con soporte, por ejemplo, sobre las uniones entre los paneles estructurales adyacentes. En zonas con alta elevación, vientos fuertes o lluvia impulsada por el viento, se recomienda cubrir toda la estructura base del techo con la membrana granulada RhinoRoof. La membrana granulada RhinoRoof es una barrera contra el vapor y la humedad, por lo que debe instalarse en espacios con ventilación adecuada. Siga TODOS los códigos de construcción que correspondan a su zona geográfica y tipo de estructura. Siga las recomendaciones del fabricante del recubrimiento del techo y de la Asociación de Fabricantes de Techados de Asfalto (Asphalt Roofing Manufacturers Association), para las tejas asfálticas. La membrana granulada RhinoRoof NO se debe instalar sobre enmasillado no curado, selladores no curados o vinilo flexible. Si la membrana se instala sobre cualesquiera de estos materiales, el adhesivo se derretirá y se correrá, ocasionando vetas y goteos antiestéticos. Es responsabilidad de quien realiza la instalación determinar si todos los materiales utilizados son compatibles entre sí. Comuníquese con el fabricante del enmasillado o sellador para comprobar que el producto es compatible con asfalto. La membrana granulada RhinoRoof no está diseñada para exposición indefinida al aire libre. El techado final debe instalarse dentro de los 30 días posteriores a la instalación de la membrana impermeable. Dependiendo de la inclinación del techo y de las condiciones de la superficie, podría ser necesario utilizar cintas de carga (listones) para apoyar los materiales de techado que se colocan en el techo. Recuerde sellar los orificios de los sujetadores en los que se fijan las cintas o listones después de que han sido retirados. Proteja todas las áreas del techo para evitar daños durante la instalación del techo y el transporte de materiales, mediante el uso de barandales protectores que permitan el paso de personas, equipo y productos. Tenga cuidado de no cargar demasiado material en la plataforma del techo concentrado en una sola área. Siempre que sea posible, distribuya el peso sobre los soportes estructurales. Al igual que con otros productos para techado, siempre siga las prácticas y códigos de seguridad de instalación de techos de la OSHA; y siempre utilice y lleve puestos dispositivos para la protección contra caídas cuando trabaje sobre un techo. El papel antiadherente es resbaladizo, por lo que debe retirarlo del área de trabajo inmediatamente después de la aplicación. Tenga cuidado cuando camine o se quede parado sobre la membrana granulada RhinoRoof ya que la resistencia al deslizamiento puede variar según las condiciones de la superficie, el clima, el tipo de calzado y la inclinación del techo. Es posible que si no utiliza el equipo de seguridad y el calzado adecuados pueda lesionarse. La sous-couche granulée RhinoRoof® est conçue pour être utilisée sur les toits à forte pente (2:12 ou plus) sous les bardeaux d’asphalte, les bardeaux composites, l’ardoise à toiture et les bardeaux de fente afin de créer une barrière secondaire qui repousse l’eau. La sous-couche granulée RhinoRoof® doit être entreposée à la température ambiante, à la verticale, dans l'emballage en carton d’origine et dans un endroit sec et bien ventilé. Conservez le produit à l’abri des éléments et des intempéries. Seuls les rouleaux à être utilisés le jour même devraient être retirés de leur aire d'entreposage. Pour de meilleurs résultats, entreposez le produit à une température entre 4,4 °C (40 °F) et 32 °C (90 °F). S’il est impossible d’entreposer le produit à la température ambiante et que le produit se trouve à une température de 4,4 °C (40 °F) ou moins, déplacez le produit vers un endroit chaud avant l’installation de celui-ci. Si le produit a été entreposé à une température supérieure à 32 °C (90 °F), il pourrait être difficile d'enlever la pellicule détachable au dos de la membrane. Si tel est le cas, déplacez le produit dans un endroit ombragé jusqu’à ce que la sous-couche soit tempérée. Une fois le produit tempéré, la pellicule détachable au dos de la membrane peut être retirée facilement. Balayez la surface de la plate-forme de toit pour éliminer la poussière et les débris. Remplacez toutes les planches de bois endommagées ou pourries. La sous-couche granulée RhinoRoof doit être installée directement sur des panneaux de contreplaqué d’une épaisseur minimale de 3/8 po, sur des panneaux à copeaux orientés d’une épaisseur de 7/16 po ou sur des panneaux de toiture d’une largeur minimale de 6 po (les espaces ne doivent pas excéder 1/4 po). Pour les projets de réfection de toiture, remplacez tous les panneaux endommagés par l’eau et balayez soigneusement la plate-forme de toit pour éliminer la poussière, la saleté et les clous. N'installez pas la sous-couche par-dessus un vieux revêtement de toit. Pour de meilleurs résultats, la sous-couche granulée RhinoRoof doit être installée par-dessus une plate-forme de toit propre, lisse et sèche lorsque la température de l'air, de la membrane et du substrat est supérieure à 40 °F (4,4 °C). Pour une installation par temps froid, il est nécessaire d’utiliser un produit d’apprêt et une méthode de fixation par clouage dissimulé sur les chevauchements (voir la note 5 sous la section « Installation »). L’apprêt doit être à base de solvants ou à base d’eau et doit satisfaire à la norme ASTM D41 sur les membranes autoadhésives à base d’asphalte. Tout substrat apprêté doit être complètement sèche avant l'installation. Veuillez vous référer aux recommandations du fabricant. Pour une installation sur les toits à forte pente (5:12 ou plus), dans des régions exposées aux vent forts ou lors d’une installation à une température supérieure à 38 °C (100 °F), il est recommandé de fixer la lisière à l’aide de clous dissimulés comme expliqué à la note 5 de la section « Installation ». La sous-couche granulée RhinoRoof doit être disposée horizontalement (parallèlement) par rapport à l’avant-toit, face imprimée vers le haut. Les chevauchements horizontaux doivent être de 3 po et les chevauchements verticaux doivent être de 6 po, tout en veillant à ce que la partie inférieure de la sous-couche soit en affleurement avec l’extérieur du larmier. Le bord inférieur de la sous-couche est le bord où il n’y a pas de lisière adhésive. Les raccords d’extrémité doivent être décalés d’au moins 6 pieds sur les rangs suivants. Pour les pentes de plus de 5:12, après l’installation de chaque morceau, chevauchez la lisière de 3 po et, si nécessaire, fixez à l’aide de clous espacés de 12 po centre à centre dans la lisière. Utilisez des clous de toiture à tête de 3/8 po, d’une longueur suffisante pour réaliser un clouage dissimulé dans la surface de la lisière. Les clous doivent être espacés de 12 po centre à centre dans la lisière. Consultez les codes du bâtiment en vigueur dans votre localité pour les exigences en matière de fixation. Travaillez toujours à partir du point le plus bas et poursuivez l’installation en vous déplaçant vers le haut. Installez la membrane dans les noues avant de la poser près de l’avant-toit. Coupez la membrane en longueurs de 15 à 20 pieds. Pelez 1 à 2 pieds de la pellicule détachable au dos de la membrane, alignez la membrane et continuez à retirer la pellicule détachable au dos de la membrane. Exercez une pression avec les mains ou marchez sur la membrane et passez ensuite un rouleau de 40 lb ou plus pour lisser et fixer la membrane. Il est recommandé de passer un rouleau à main, de 10 lb et d’un minimum de 4 po de largeur, par-dessus et directement sur le bord de la lisière. S’il est impossible d’utiliser un rouleau ou si cette étape n’est pas considérée comme sécuritaire, marchez sur toutes les surfaces là où il y a des chevauchements et autant que possible, sur toute la zone là où la membrane a été installée afin de presser la surface adhésive contre la surface de la plate-forme de toit et des chevauchements. La sous-couche granulée RhinoRoof doit être installée par-dessus le larmier métallique près de l’avant-toit à moins d’indication contraire dans les codes locaux. Le long des bords, installez d’abord la sous-couche granulée RhinoRoof et installez ensuite le larmier par-dessus la sous-couche. Ne repliez pas la sous-couche granulée RhinoRoof par-dessus le bord du toit sauf si le bord est ensuite recouvert avec un larmier ou un autre matériau pour solin. Dans les endroits où il pourrait y avoir une accumulation de glace, installez la sous-couche granulée RhinoRoof depuis l’avant-toit jusqu’au toit, en remontant jusqu’à au moins 24 po à l’intérieur du mur extérieur, en mesurant horizontalement. Pour des exigences particulières, veuillez consulter le code du bâtiment en vigueur dans votre localité. Pour une installation sur les noues, retirez la pellicule détachable au dos de la membrane, centrez la membrane sur la noue et installez celle-ci en exerçant une pression avec les mains depuis le centre de la noue en vous déplaçant vers l’extérieur, dans chaque direction. Remarque : Il est très important de s’assurer que la sous-couche granulée RhinoRoof reste en contact avec la plate-forme de toit depuis l’intérieur de la noue jusqu’à l’extérieur de celle-ci. La sous-couche granulée RhinoRoof ne doit jamais être suspendue par-dessus une noue ou créer un pont lorsqu’elle traverse celle-ci. Il est recommandé d’exercer ensuite une pression avec un rouleau lourd ou en marchant sur la surface de la membrane. Accordez une attention particulière à TOUS les bords du périmètre de la membrane. Si les fixations laissent des trous dans la membrane lorsqu’elles sont retirées ou si d’autres pénétrations sont accidentellement produites, ces trous ou pénétrations doivent également être colmatés. N'installez pas de fixations à travers la membrane sur des zones non supportées de la structure de la plate-forme de toit, comme les joints entre les panneaux de structure adjacents. Pour les régions de haute altitude et les régions exposées aux vents forts ou à la pluie chassée par le vent, il est recommandé de couvrir la surface entière de la plate-forme de toit avec la sous-couche granulée RhinoRoof. La sous-couche granulée RhinoRoof crée une barrière contre l'humidité et la vapeur et doit donc être installée au-dessus d’un(des) espace(s) bien ventilé(s). Respectez TOUS les codes du bâtiment en vigueur dans votre région et qui s’appliquent au type de structure de votre bâtiment. Respectez les recommandations du fabricant de la couverture de toiture et de l’Asphalt Roofing Manufacturers Association (pour les bardeaux d’asphalte). La sous-couche granulée RhinoRoof ne doit PAS être installée sur du calfeutrage non durci, des scellants non durcis ou du vinyle flexible. Si la sous-couche est installée sur l'un de ces matériaux, l'adhésif fondra et coulera, ce qui causera des traces et des gouttes inesthétiques. Il est de la responsabilité de l'installateur de déterminer si tous les matériaux utilisés sont compatibles entre eux. Communiquez avec le fabricant du produit de calfeutrage ou du produit d'étanchéité pour vérifier si le produit est compatible avec l'asphalte. La sous-couche granulée RhinoRoof n’est pas conçue pour une exposition extérieure prolongée. Le revêtement final de la toiture doit être installé dans les 30 jours suivant la pose de la sous-couche. Selon la pente du toit et l’état de la surface, des tasseaux peuvent être requis pour soutenir les matériaux de couverture déposés sur la toiture. N'oubliez pas de sceller les trous des tasseaux après les avoir enlevés. Protégez les surfaces de toiture achevées pour éviter les dommages lors de l’installation de la toiture et lors du transport des matériaux en installant des trottoirs de bois protecteurs permettant la circulation des personnes et le transport d’équipements et de produits. Veillez à ne pas trop charger de matériaux sur une même zone de la plate-forme de toit. Répartissez le poids sur les supports structuraux dans la mesure du possible. Comme pour tout produit pour toitures, respectez toujours les codes et les pratiques de construction de toiture sécuritaires (OSHA) et utilisez et portez toujours les dispositifs de protection antichute lors de travaux effectués sur les toits. La surface de la pellicule détachable à l’endos de la membrane est glissante et doit être retirée immédiatement de la zone de travail. Faites preuve de prudence lorsque vous marchez ou que vous vous tenez debout sur la membrane granulée Rhinoroof puisque la résistance au glissement peut varier selon l’état de la surface, les conditions météorologiques, les chaussures utilisées et la pente du toit. Le fait de ne pas utiliser un équipement de sécurité approprié ou de ne pas porter de chaussures appropriées peut causer de graves blessures. Test data is based on an average taken over several production runs and should not be considered or interpreted as minimum or maximum values. Values are typical data and not limiting speciﬁcations. All values ± 10%.